Remote Wreck Site Presents Logistical Challenges - Global Diving & Salvage, Inc. In early October 2016, the US Coast Guard (USCG) responded to a distress call from the crew of the 45-foot sailing vessel Soteria, who reported their vessel was taking on water during a storm. At the time, the Soteria was located 40 miles northwest of Gray’s Harbor off the Washington Coast; weather reports indicated 20-foot seas with winds gusting over 50 mph. The USCG responded to the distress call with rescue craft and a helicopter, safely removing the three crewmembers from the Soteria. 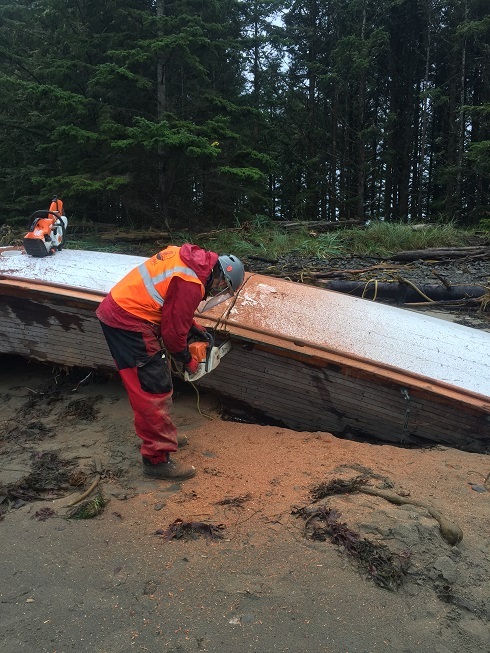 Without a crew, the abandoned vessel was left to drift and continued rough weather over the next few days caused the vessel to run aground and break apart near Sand Point in Olympic National Park. The wooden sailboat split down the middle; the port side washed ashore and became buried in the sand above the high tide line, while the starboard side broke into multiple pieces and was distributed along the stretch of beach along with the mast, sails and rigging. 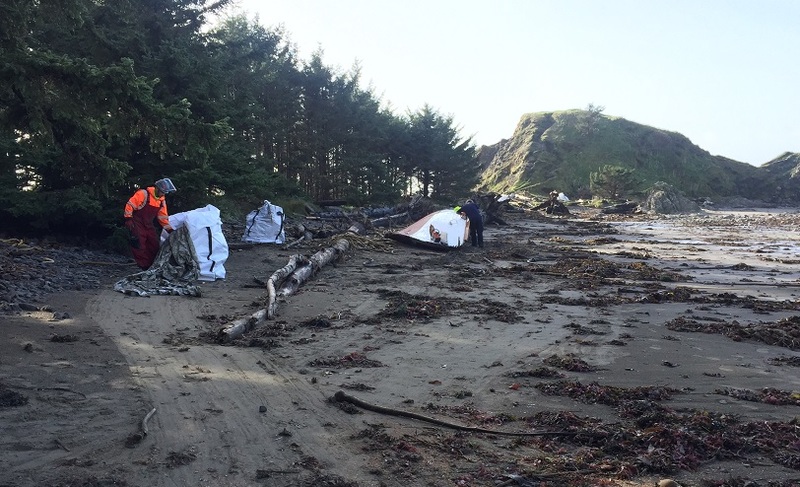 The keel, anchor, anchor chain, motor and other debris were scattered throughout the intertidal zone at the point, making access to these components limited during much of the day. Global was contacted by the Soteria’s owner to evaluate the wreck, remove any fuel and hazardous materials, and remove the wreck debris. The remote wreck site made removal difficult for a number of reasons. The wreckage on the intertidal portion of the beach lay within the Olympic Coast National Marine Sanctuary, while the wreckage above the high tide was inside Olympic National Park boundaries, and the Makah Tribe have several significant cultural sites in the area; this meant involving all three agencies for proper permitting and permission to access the site. Once access was granted, Global’s team still had to get to the site. The nearest access point was the Ozette Lake Ranger Station, which meant the team had to hike the remaining three miles to the wreck site each day. The team’s tools and supplies were brought in by helicopter, which was also used to lift out debris from the wreck. The large portions of the vessel were cut into pieces that could be rigged and lifted out by the helicopter; the rest of the wreckage was put into bags and lifted out. 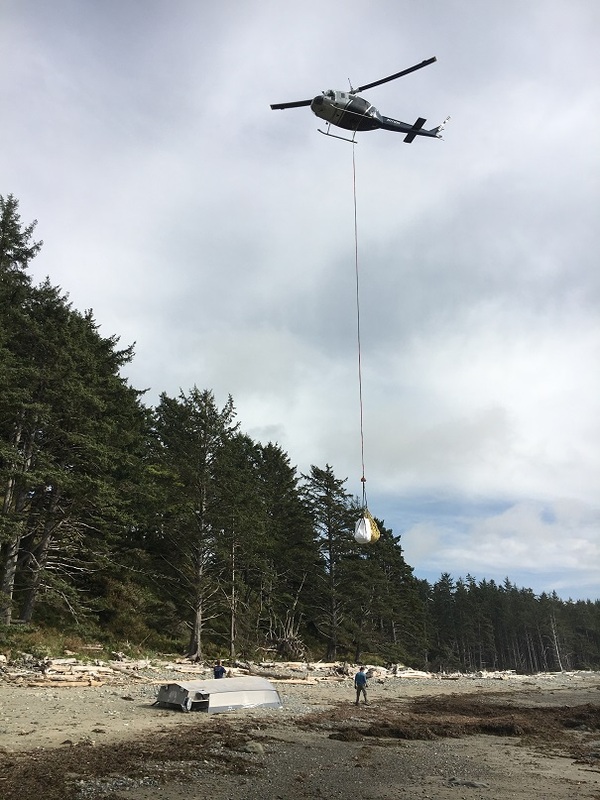 Global’s five-person crew removed a total of 14,480 lbs of debris from the beach, performing six helicopter lifts over two days. 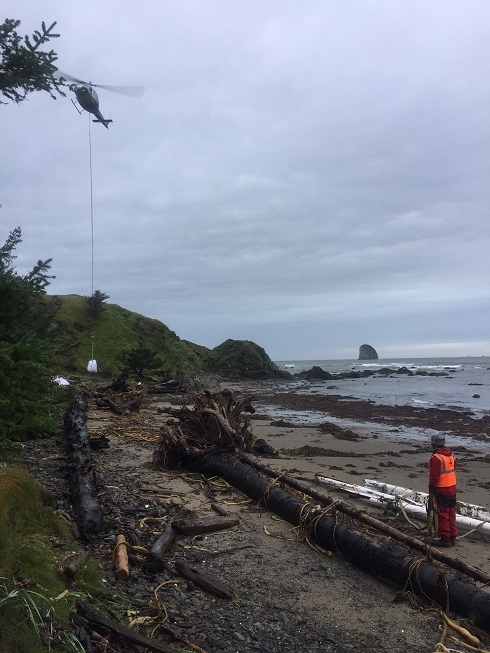 Poor weather conditions were a constant factor during the cleanup process; limited visibility and severe wind gusts delayed the helicopter lifts on several occasions.